The party is over. I suppose it was just a matter of time before ESPN pulled the plug on cord cutting sports fans. If you were a heavy user of ESPN3 to watch premium sports content, you’ve surely noticed the drastic change in the quality and quantity of the ESPN3 offerings this Fall. Gone are the Thursday night college football games. Gone are the premium Saturday afternoon college football games. Gone are the NBA games and top shelf college hoops. Gone are the days that you could ditch cable and still get a ton of quality live sports through ESPN3 and a broadband Internet connection. You may still see many of those games in the ESPN listings, but most will be followed by a blackout notice and a link to a map much like the one below. 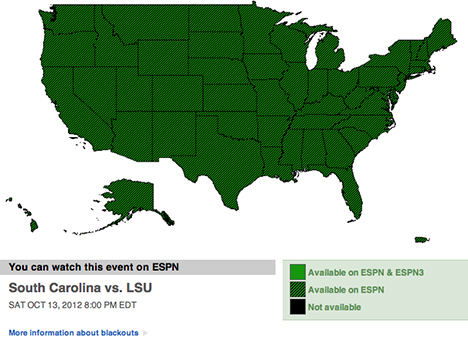 So, which part of the country will be blacked out on ESPN3 from watching the big South Carolina – LSU game on Saturday? Only all of it. Now, if you are an ESPN subscriber, and you happen to subscribe through Comcast, Time Warner, BrightHouse Networks, or Verizon FIOS, you’ll still get access to all those premium goodies as long as you authenticate using a TV Provider username and password. But it’s ONLY those customers. So, not only do you have to pay for cable or satellite, but your provider has to have come to an agreement with ESPN ($$$) to allow customers to also watch the content they already pay for, on a computer or other device in addition to a TV. What makes this even more frustrating is that ESPN also charges your ISP for the privilege of accessing ESPN3. Which, you can bet, is being passed onto Internet subscribers. As far as I’m concerned, ESPN3, as it now stands, is essentially useless. So, Verizon, if you are reading this, go ahead a stop paying for ESPN3 and pass on the savings to us. XBox owners with XBox Live subscriptions knew the joy of having ESPN3 content streamed through their TV courtesy of the ESPN XBox app for the last few years. 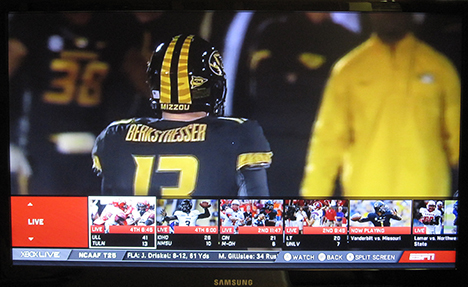 Reports are that WatchESPN is coming to XBox “soon,” which means those privileged TV subscribers will get back access to all that glorious ESPN content. It does beg the question, however, if you have ESPN through Cable or Satellite, why do you need to watch it through an XBox? Better yet, why would you want to pay an extra $60 / year for XBox Live so that you can watch through the XBox. ESPN3 delivered the essentials. Live sports. And as a sports fan, that was really all I needed. It’s what made ditching cable bearable. There were a few shows that I would watch on a fairly regular basis, like PTI and NFL Sunday Countdown, but when I cut the cord, I found that I really didn’t miss them. Most of the non-live-sports programming is basically just filler. Perhaps it’s a generational thing, but I still haven’t met anyone who will admit to watching SportsNation or whatever that crap is that they air before PTI. What ESPN has done is to turn ESPN3 into what ESPN was in the early 1980’s. A haven for sports you didn’t really care about or perhaps didn’t even know existed. The difference is that in the early 80’s there was so little sports on TV, you might watch Australian Rules Football or, college baseball, or whatever, just because it was on TV. I mean, with the possible exception of local pro sports teams, how else could you couldn’t watch live sports on a Tuesday in 1984? While ESPN3 technically still lives on, good luck finding something worth watching… unless you happen to be looking for the semifinals of US Women’s Squash or a gridiron battle between Stoney Brook vs. Coastal Carolina.